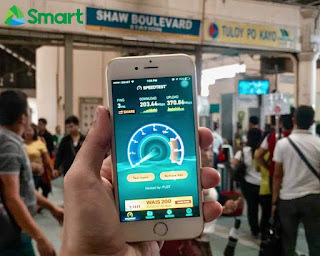 Smart Communications Inc. to offer free WI-Fi along EDSA in partnership with the Department of Information and Communications Technology (DICT) and the National Telecommunications Commission (NTC). As stated in the first State of the Nation Address (SONA) of President Rodrigo Roa Duterte, the government will provide high speed internet and free Wi-Fi services in selected public areas nationwide. This coming June 12, 2017, Smart will start to offer this Free Wi-Fi service at 13 MRT stations from North Avenue to Taft and the continuous street level stretch of EDSA from Guadalupe to Cubao. This is open to all subscribers, you can connect up to 30 minutes and enjoy the high-speed internet connection daily with data cap. You can download, stream and surf all you want on the given period of time. Just turn the Wi-Fi connection of your phone, table or laptop. Select #SmartWifi @MRT EDSA from the list of available access point. Connect and start browsing for 30 minutes. If you want to extend after your free minutes, you can purchase additional hours from their partners and retailers or convert your Smart, Talk N Text (TNT) and Sun Cellular via SMS registration. If you’re one of the daily commuters in EDSA this Free Wi-Fi project can help a lot while you are travelling along the street mentioned. You can check your emails, reply to messages, download important files and more without waiting too much loading time.